Home / News / Cabinet official: "For the first time, this government was able to say to oligarchs, ‘pay your taxes now’"
Cabinet official: "For the first time, this government was able to say to oligarchs, ‘pay your taxes now’"
President Rodrigo Duterte, the first president from Mindanao, who have been in public service for a very long time is someone that the ‘oligarchs’ and media cannot control. 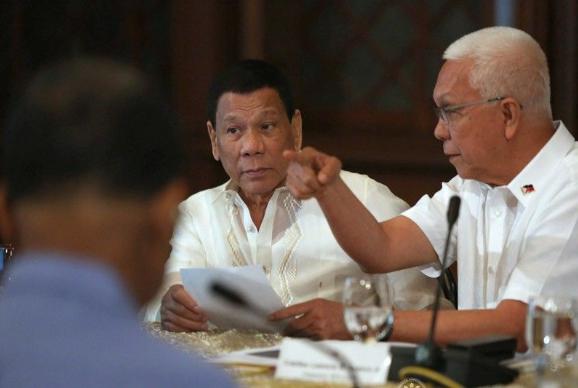 Cabinet Secretary Leoncio Evasco Jr. on Monday accused the media and “oligarchs” of working together to attack the president “left and right”. “For the first time, this government was able to say (to these oligarchs), ‘pay your taxes now’,” Evasco said during the launch of “Biyaya ng Pagbabago” at Benguet State University, pertaining to rich families who controls media companies. “There is an existing connivance between the oligarchs and the media who are now hitting the administration by reporting mostly negative news against the President,” the Cabinet Secretary added. Evasco said that these families or individuals are attacking the president because their business interest are affected by Duterte’s decision especially the order for the Bureau of Internal Revenue (BIR) to accelerate tax collection. In 2017, Philippine Airlines (PAL) paid its long-time debt to the government amounting to around P 6 billion. Then, it was another breakthrough when the cigarette company Mighty Corp settled for P 30 billion its tax delinquency case. Meanwhile, a tax evasion case was filed against the Dunkin’ Donuts franchisee in the Philippines. The Cabinet Secretary also assured the people who attended the event that the administration of Duterte is promoting their interest. Evasco explained that the government will not stop with its achievements, as the big companies in the country are being investigated for possible tax delinquencies such as the mentioned firms.